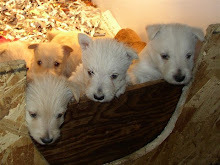 Montgomerie of Camas - AKC Scottish Terriers: a new litter of puppies! Catrina & Fritz had a litter on August 18th - 4 puppies! One of the girls is still for sale, but be quick!